With a population of over 1.4 million, San Antonio is the seventh-largest city in the country and the second-most populous in Texas. Originally settled by Payaya Indians, the region became a part of the Spanish colonization effort in the early 18th century when Spanish Catholics built a complex of missions — including the Mision de San Antonio de Valero, better known as The Alamo — that to this day remains one of the city’s main historical attractions. Long an important trade hub on the Camino Real, the city was a key location in the war for Texan independence from Mexico. The rise of interstate rail in the 19th century further solidified the city’s importance as a center for commerce, specifically the transportation of cattle. The city emerged in the 20th century as one of the Southwest’s major cultural centers, a vibrant and modern city with world-class civic and educational institutions. The past 45 years in particular have seen explosive growth, with the city more than doubling its population since 1970. San Antonio’s population reflects the region’s varied history. It is one of 24 majority-minority cities in the U.S., with over 60% of its population identifying as Hispanic, the vast majority of which are Mexican-American. San Antonio’s vibrant heritage is visible in its architecture and public art, tasteable in its award-winning food, and audible in both its music and the Spanish (mixed with a fair number of y’alls) echoing across the water of the Riverwalk. Home to six Fortune 500 companies, 31 institutes of higher education, and one of the largest medical research and hospital complexes in the state, San Antonio is a natural magnet for students and young professionals. And despite the city’s dynamic personality and explosive growth, it’s still quite affordable for young people trying to begin their lives. San Antonio is a very large city, spreading for miles outside the downtown center. That means that properties are available year round, especially the farther out you go. But if you’re looking at places near any of the major universities and colleges in the area — University of Texas at San Antonio , Trinity, Incarnate Word — the housing market can get pretty competitive during certain times of the year. In general, the earlier you begin looking for a place, the better. Many students begin their search around November, browsing through listings and finalizing their roommate plans. By February, students are beginning to tour potential apartments and sign leases, and when May comes around, most students have already grabbed the best apartments near campus. The selection can get slim during the summer, but don’t worry — there are still places out there for you! One of the reasons San Antonio’s population has grown so much in the last 40 years is that the city has moved its borders, annexing smaller towns and communities. Sometimes, though, those smaller towns retain their autonomy, and operate their own municipal governments within the city. Cities like Alamo Heights, Shavano Park, and Balcones Heights are essentially independent “islands” within the San Antonio city limits, though many people conceive of them as neighborhoods. San Antonio is a large, sprawling city that was designed with vehicular travel in mind. Walking or biking from one place to another is likely to get tiring, especially with the hot Texas sun beating down on you. Many people own a car or carpool with their fellow students or coworkers. The city’s bus system, VIA, provides service in multiple areas around the city at a fair rate. Unfortunately, it’s the city’s only public transportation option, as San Antonio is the largest American city without an intracity rail system. However, the UTSA bus system is also very reliable, offering free student transportation to both on- and off-campus stops. Let’s talk about the Riverwalk. Touristy? Yes. Beautiful? Also yes. And in recent years, this sub-street level dining and shopping district on the San Antonio River has become less of a chain-restaurant-clogged gauntlet, as the city has extended the attraction into the city’s north and south sides. 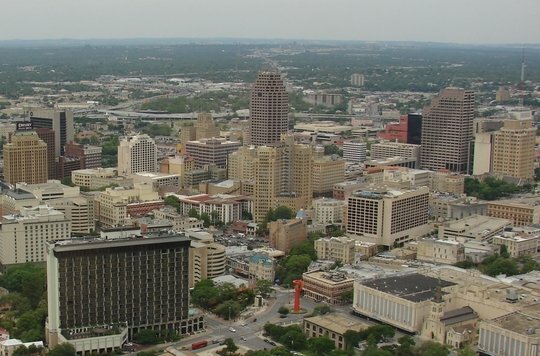 Extension projects since 2009 have focused on preserving the unique local flavor of downtown San Antonio, with initiatives supporting sustainability and local businesses. You can now walk from the Hemisfair Park to the Alamo, all the way to the Pearl, a shopping district on the site of the old Pearl Brewery, which ceased operation in 2001 and is now the anchor for the city’s trendy north side. San Antonio has seen renewed development and interest in its downtown, which after decades of slow growth has in recent years become an attractive area for young professionals. Still, the city’s sprawling design means that the city’s bar scene is concentrated in pockets or clusters. Check out the south side’s King William District for upscale dining and cocktails in a historically gorgeous neighborhood, or north Broadway for businesses catering to students from nearby Trinity and Incarnate Word. If you’re a beleaguered college student looking to turn back the clock to simpler childhood pleasures, Six Flags Fiesta Texas is only a stone’s throw away from UTSA’s north campus. Get a season pass and you can ride the recently revamped Iron Rattler (which was once the world’s tallest and fastest wooden roller coaster but now has a metal track) whenever the urge strikes you. If you know one thing about San Antonio history, you know the story of the Alamo, a Spanish mission that became the site of the most famous battle in the war for Texan independence. The mission’s distinctive facade (in reality only a small part of the chapel) is synonymous with San Antonio. Every year, over 2.5 million visitors walk through the Alamo’s on-site museum and gardens, making it the most-visited tourist attraction in the state. But don’t let the Alamo’s fame blind you to the other missions in the area, which are also beautiful repositories of the region’s culture. Mission San José is the largest, and has special meaning to Catholics who come from miles around to take in the Mariachi Mass. San José, along with Mission Concepción, Mission San Juan Capistrano, and Mission Espada, make up The San Antonio Missions National Park, a UNESCO World Heritage site. Not every restaurant in town is focused on Mexican or Tex-Mex, however. In recent years, a spate of exciting restaurants have hit the local dining scene. Feast offers inventive small-plates and cocktails, and is well known to offer one of the best brunches in the city. Just next door at Hot Joy chef Quealy Watson has devised an inventive menu that melds pan-Asian influences with South Texas classics. Think brisket dan-dan noodles, or a traditional Mexican dish like grilled corn with cotija, spiked with kewpie and furikake. Chef Mark Bliss — whose restaurant Silo helped put San Antonio on the fine-dining map — runs the inventively named Bliss, which serves up some of the most elegant new-American cuisine in the city. And Rebelle, opened by Feast’s Stefan Bowers in the iconic St. Anthony Hotel, has since its opening in 2015 quickly become one of the best restaurants in San Antonio, melding local ingredients like grilled quail to classic French technique and Moroccan influences. San Antonio has seen an explosion of craft beer and cocktail bars in the past five years. The Brooklynite is just a few blocks off the Riverwalk but it feels a world away, especially if you knock back more than one of the speakeasy’s unique cocktails, like Cross My Heart & Hope for Rye (rye, mezcal, house pecan cordial, sweet vermouth, and spicy fire and damnation bitters). Bar 1919, in the Blue Star Arts Complex, was recently named one of the best bars in the country for whiskey by USA Today, and with a spirits list exceeding 300 bottles, it’s easy to see why. Barbaro serves up adventurous pizzas alongside its inventive drinks, which appear on the menu under the headings “The Good” (lighter aperitifs), “The Bad” (bright and boozy), and “The Ugly” (stirred). Treat yourself to a Treat Yo Self (rum, macadamia nut liqueur, lime, pineapple, coconut milk, bitters). Or just order a beer — locals drink Shiner (brewed in nearby Shiner, TX) and Lone Star (basically Texan PBR). The Majestic Theatre is one of the most beautiful theaters in the south, and maybe the country. Built in 1929, the theater features a domed ceiling painted to resemble a night sky, inset with lights to suggest stars, and mostly hosts traveling Broadway companies and concerts. The city also contains a number of excellent museums. The San Antonio Museum of Art is housed in the historic Lone Star Brewery complex, and features the south’s largest collection of Asian Art, as well as extensive holdings of pre-Columbian, Spanish Colonial, and Latin American folk art. The McNay Art Museum was the first museum of modern art in Texas, and exhibits work by artists such as Georgia O’Keefe, Henri Matisse, and Paul Gauguin in a gorgeous Spanish Colonial complex, situated on a 23-acre site — complete with Japanese garden and fountains — that is a destination in itself. Have kids in tow, or just want to feel like a kid again? The Witte Museum features hands-on, fascinating exhibits about history, culture, and science. Check out the bug room. Rodeos are an important facet of Texan culture, deeply ingrained in everyone who grew up in the state. The San Antonio Stock Show & Rodeo takes place each February, and showcases some of the best rodeo competitors in the world. The event is held at the AT&T Center, home of the San Antonio Spurs, and is so popular that the beloved basketball team has to take an extended road-trip for the two weeks the rodeo overtakes their court. Fiesta, the largest festival in the city, celebrates a different aspect of local culture. Begun in 1891 to commemorate the battles of the Alamo and San Jacinto (which clinched Texan independence from Mexico in 1836), Fiesta now is a wholesale celebration of San Antonian history and culture. For a week in April, the city turns into one giant party. Food stands line the streets and music fills the air during an array of concerts, events, and two major parades: The Battle of Flowers and Fiesta Flambeau, which together draw over 1 million people to the city center. For a slightly quieter festival experience, try the Texas Folklife Festival, which has celebrated Texas’s unique blend of cultures— Native American, Mexican, Spanish, German, Polish, and many more — for 45 years at the Hemisfair campus of UTSA. Shopping in San Antonio was once largely confined to North Star Mall, famous for the pair of 40-foot-tall boots standing guard over its parking lot. But in the past 20 years a number of new major shopping centers have brought new choices to the area. The Shops at La Cantera is the high-end shopping destination in San Antonio, and features luxury brands in an outdoor setting conveniently located near UTSA. If you'd like a more typical mall shopping experience, head to the Alamo Quarry Market, which houses dozens of major stores in buildings that were once part of the Alamo Cement Company. For unique San Antonio-flavor gifts and crafts, try El Mercado Market Square. The Pearl is great for quirky boutiques, as is the stretch of Broadway near Austin Highway in Alamo Heights. Despite years of effort — the city even built a football stadium in the early ‘90s in a failed attempt to lure the NFL to the city — San Antonio remains a one-sport team. But what a team it is: The NBA’s San Antonio Spurs have won five championships in the past 17 years, most recently in 2014, and current and former stars like Tim Duncan, Manu Ginobili, David Robinson, and George Gervin are afforded near-messianic status by locals. The San Antonio Stars of the WNBA also enjoy considerable local support and have made the playoffs in seven of their 13 seasons. College sports are popular — the University of Texas-San Antonio is D-1, and the basketball team made the NCAA tournament in 2011 — but in South Texas, high school football is king. Locals turn out by the thousands for Friday night games. It only takes a few minutes to get to Lake Braunig from the city, and it is a wonderful place to fish and just enjoy a day out on the water. Farther north, the Hill Country town of New Braunfels is a popular weekend getaway for tubing on the Comal and Guadalupe rivers, or waterslides at the German-themed waterpark Schlitterbahn. The hills surrounding San Antonio make for challenging play at a few local golf courses — get a tee time at The Quarry, La Cantera, or Brackenridge. Within the city, the Mission Hike and Bike Trail is an 8-mile paved trail that takes you past each of San Antonio’s historic missions. The Howard W. Peak Greenway Trails System is a much more comprehensive trail system, with more than 47 miles of trail.